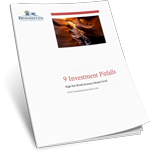 Download 9 Investment Pitfalls Free Today! Securities and advisory services offered through Independent Financial Group, LLC (IFG), a registered broker-dealer and investment advisor. Member FINRA/SIPC. Investment Resources and IFG are not affiliated. Licensed to sell securities in the following states: AK, AR, AZ, CA, CO, FL, MO, MT, NV, OR, UT, TX & WA.